MyRightWingDad.net: Fw: YA DONT KNOW NUTIN! Fw: YA DONT KNOW NUTIN! To understand the next 4 years you have to understand the world according to Chicago . While it is a city of Illinois it is also a completely different country with a whole different set of morals and language. There are only three rules there which anybody can understand. You don't even need an attorney to understand them and if you need an attorney , well . . you know too much so look out for Rule #3! RULE #1 No matter what you see, hear, or do you don't know anybody and you don't know nutin! RULE #2 If you capture something on tape or camera it doesn't reveal nutin! RULE #3 If you know what anybody knows in Chicago , well . . . dat's da last ting you'll ever know and you'll wish youse never knew nutin! Now pay close attention we don't want to have ta say dis more dan once It's very simple . . . we'll illustrate. If you have too, read slow! These two? They don't know each other! Remember the first picture? Be sure you only remember that they don't know and you certainly don't either! Da fellas in da background in this picture? Well . . . what fellas? We don't see nutin! Oops! How did that get in here? Da guy on the left? For all you know he's Santa Claus. And the guy on the right . .well, he's Da Easter Bunny! That's all you need to know and you're better off if you don't know that. Go to your eye doctor, your eyes is liein to yas! Capish? We don't want to know what they're saying. He knew too much and now . . .well . . . now no one knows where he is. Is da big picture clear? Not these pictures gumwad, cuz youse already forgot dem! They don't know nutin and neither do we! 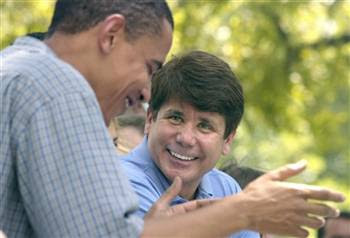 This entry was posted on 2/05/2009 05:27:00 AM and is filed under BARACK OBAMA , BLAGOJEVICH , ILLINOIS . You can follow any responses to this entry through the RSS 2.0 feed. You can leave a response, or trackback from your own site. Meh. Whats the point? 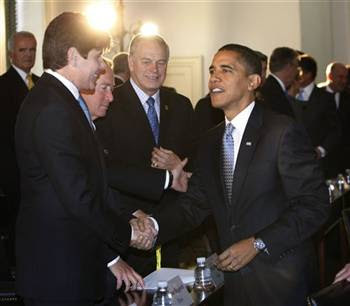 A former State Legislator and Senator has met with the (now former) governor of his state? I should hope so! I mean, its not like he's a shady lobbiest like Abramoff or a brutal dictator like Saddam, both of which have been filmed in the company of many prominent republicans. 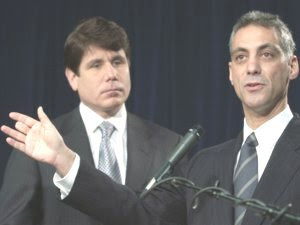 Answer this: if Chicago's so crooked, why did they swiftly and decisively impeach Blago and ban him from ever holding office again? It's like the Democrats should only hang out w/feral children, bc frankly, folks, those are the only, uh, people who won't yet have done "something wrong." 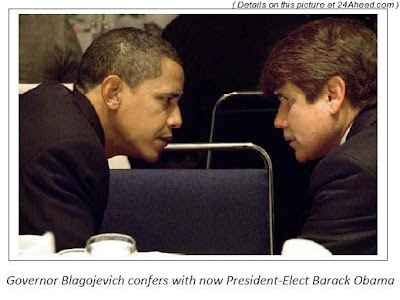 I agree that it bears investigation to see IF Emanual, Obama, et al, were complicit in any of the dirty dealings of Blago, and we ALL do know that "pay to play" is very common in IL politics (and elsewhere). But that said, the federal investigation said over & over: we found NOTHING. Got it folks: nada, zip, zero, null set, there is nothing for you to see here except stooopid photos that prove how stooopid YOU are. And apparently folks in Chicago talk like the Sopranos, or something. Get your reginal accents right if you want to be taken seriously, or else fuggedaboutit! Sopranos? I read it in the voice of Prison Mike. 2/23/09 - Whoever wrote this clearly knows all there is to know about knowing "nutin." Fw: Finally, a REAL cell phone for REAL people!!! fwd: Who wants Uncle Sam as a stockholder? Fwd: Fw: How many zeroes are in 1 billion? Fwd: Should someone send this to Obama?! Fw: This one is a KEEPER ! ! ! ! Fwd: Fw: The Lord works in mysterious ways! !